A new era of standardized testing is quickly approaching with the dawn of the Common Core Standards assessments in the fall of 2014. And districts all over the country are adjusting their curriculums to meet the challenge. The Common Core requires students to think and learn in a much deeper way, and one of the best ways to facilitate that deeper learning is to get kids writing. Not just in English class, but all the time. classes—from math to social studies to science—and not just in language arts. And it’s a perfect fit for Common Core. The new standards will require that content area teachers reinforce the benchmarks that ELA teachers traditionally have covered in their classrooms. This means that the burden of literacy will shift to the entire teaching staff. Math, science and history teachers will be tasked with using writing assignments to help kids learn the subject matter at hand, whether it’s photosynthesis or algebra. Going forward it will be more important than ever that teachers coordinate their lesson plans in support of the Common Core Standards. Learning to write, and write well, is a crucial life skill. Not only does it help one succeed in school, it’s vital to success in the “real” world too. Writing has become essential in today’s wired world. We communicate through the written word on a daily basis via email and text. And when today’s elementary and middle school children enter the work force, they will be expected to know how to fire up their computers and write coherent, intelligent content pretty much no matter what field they choose. Writing increases the depth of knowledge on a subject and helps students master any specialized vocabulary or terminology related to the topic. Writing develops critical thinking skills. When a child has to research something, organize her thoughts and then write about it in a clear, concise way she’s flexing her mind. Writing promotes independent thinking. In order to write, you have to have a point of view. As daunting as writing across the curriculum may sound to some teachers, there are a lot of positive things about incorporating writing into your lesson plans! Writing is a great way to engage allof your students! You won’t just hear from the kids who are always throwing their hands up. Writing helps teachers monitor student progress and gauge their strengths and weaknesses. “Writing lets you know where your students are at more than any test,” said Mr. Peha. With regular writing assignments as part of your curriculum, you don’t have to wait for a big exam to see if the kids are getting it. Writing helps you see gaps in instruction so you can adjust your teaching to insure that all of the students get what you’re talking about! Writing saves you time! Writing can be a very efficient way to cover multiple standards at once because it is such a complex, multifaceted task. In science, for example, you can get a glimpse of students’ hypothetical and procedural thinking by analyzing a written lab report. Some teachers have expressed concern over writing across the curriculum. Math and science teachers may worry they’ll have to spend an inordinate amount of time teaching writing skills and have to become experts in the six traits of writing or give up their evenings to grading stacks and stacks of papers. But that’s not the goal of writing across the curriculum. The point is deeper learning, not a perfectly developed writing product as one would aim for in English class. There are many ways to incorporate writing into lesson plans without requiring a teacher to become a six traits whiz. Journal Writing: Journal writing is a great way to create confident writers. Journals are an informal place for students to summarize their thoughts and think about class content, no matter what the subject. You can give the children writing prompts or just let them write freely! Think-Pair-Share: After a lecture or presentation, invite the children to record their thoughts. Then pair them up with another student and have them discuss the topic. Finally, open the discussion up to the whole class. You’ll find that by organizing and writing their thoughts before the discussion, the kids will have much more insightful things to add to the conversation! Quick-Writes: Quick-writes are great ways to get students to practice writing and critical thinking skills. They’re designed to focus the student’s thinking. Set a timer for 10 minutes and give the children a writing prompt. You can show them an historical picture, read a quote from your favorite scientist or ask them to write about how they’d use a math theory in real life. Anything that gets them thinking…and writing! Not only are quick-writes quick to write, they’re incredibly quick to review as well. Short writing is going to be as important as long writing with the Common Core Standards. All children will have to express coherent thoughts in both short and long time periods. Self-Assessments: Throughout the year invite the students to write about how they think they’re doing in class! Ask them what the most difficult part of the class has been or what they’ve loved learning. Not only will they get practice writing, you’ll get valuable insight into how your students are learning and what you can do to help them even more! Real World Writing: Think about the type of writing most often done in your discipline and have the students do it! For example, mathematicians write theorems and textbook problems. Scientists write lab reports. Journalists in all fields write articles. Have the kids create a website or a pamphlet for some real world writing experience. This not only gives the students hands-on experience in the discipline, but fulfills the Common Core requirement that students produce not only short writing assignments, but longer, more involved assignments too. Note Taking: There isn’t a ton of writing development in scribbling notes as a teacher is talking. But you can use note taking to flex your students’ writing skills if you tweak things a bit. Mr. Peha loves using “summary note taking” as a writing exercise. He suggests breaking your lectures down into 5 to 10-minute chunks and inviting the students to summarize what you spoke about at the end of each block. They’ll get to flex both their writing and retention skills and you’ll get a break to catch your breath! 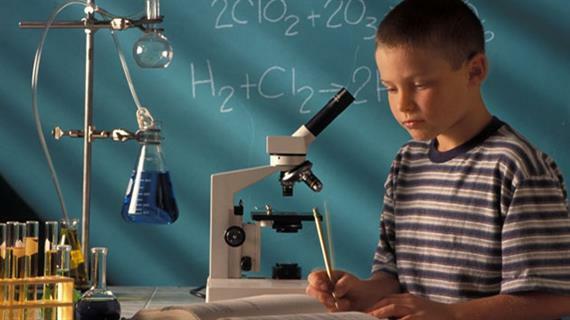 Research Projects: The Common Core Standards require all students to be able to research a topic in any discipline and write about it. So ask your students to write research-based arguments, not just persuasive arguments. The goal is for all children to become self-directed learners that are adept at researching (and writing about!) a wide variety of subjects. Writing across the curriculum is a wonderful way to get kids writing and learning in bigger, better, deeper ways. Is your school working on writing across the curriculum? Please share what you’re doing in the comments. Looking For More Writing Help?Check out our collection of free writing across the curriculum resources!